Colomba di Pasqua: Colombapasquale or Colomba di Pasquais an Italian traditional Easter cake, the counterpart of the two well-known Italian Christmas desserts, panettone and pandoro.The dough for the Colomba di Pasqua is made in a similar manner to panettone, with flour, eggs, sugar, natural yeast and butter; unlike panettone, it usually contains candied peel and no raisins. The dough is then fashioned into a dove shape (colomba in Italian) and finally is topped with pearl sugar and almonds before being baked. Note: Biga (Starter) should be prepared 12 hours earlier or the night before making Colomba di Pasqua. Mix yeast with water to dissolve. Mix in flour by hand. Stir just until blended (no lumps). Mixture will be very wet and sticky. One cup of this mixture will be needed for the bread. Combine the Biga with all of the dough ingredients except for fresh orange zest, candied orange zest, candies lemon zest and grated marzipan. Knead the dough mixture for about 12 minutes at medium speed, stopping the mixer every 3 minutes to scrape the bottom and sides of the bowl. The dough should have become elastic and satiny. The dough should be starting to leave the bottom and sides of the bowl, though it won’t form a smooth ball. Knead the fresh orange zest, candied orange zest, candies lemon zest and grated marzipan into the dough. Let the dough rise for 2 hours. The dough should have become quite puffy. Divide the dough in two pieces, with one slightly larger than the other. Shape one piece of dough into a 10″ log, with one tapered end. Shape the second piece of dough other into a 7″ log. Place the longest dough log lengthwise on a lightly greased or parchment-lined baking tray. Use the edge of your hand to form a crease in the center. Lay the shorter log crosswise across it, right at the crease. Shape the shorter log into “wings” by pulling it into a crescent shape. Cover the shaped loaf with a lightly greased plastic wrap. Set the dough aside to rise until puffy, takes about 1 to 2 hours. Make the glaze by mixing the egg white, almond flour and sugar. Gently paint this glaze all over the loaf; be generous. Sprinkle with the sliced almonds, then the sugar pearls. Bake the loaf for 15 minutes and then reduce the oven heat to 350°F. Bake for an additional 20 minutes, tenting it for the final 10 minutes of baking. The bread loaf will be golden brown when baked. Remove the bread from the oven, and carefully slide it onto a wire rack to cool. 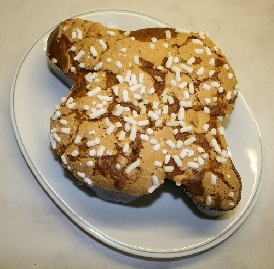 Colomba di Pasqua can be enjoyed with a glass of wine; some prefer it toasted, then drizzled with heavy cream or honey, and served with coffee.